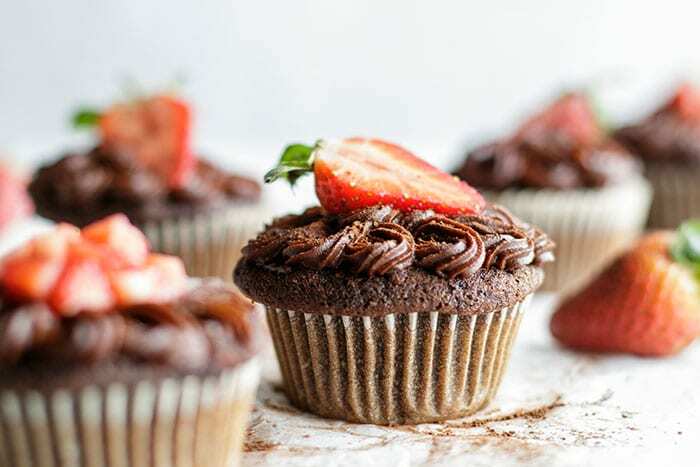 These Paleo Chocolate Cupcakes with Strawberries are the perfect treat for Valentine’s Day. It’s always good to have a few fun and festive options that are healthier choices up your sleeve! This recipe is adapted from my favorite recipe for gluten free chocolate cupcakes and uses coconut flour. I, however, am a little more difficult to trick! Gimme chocolate! A few weeks ago, we were at Starbucks, and my son was asking for a “cupcake.” Of course, at Starbucks, that means a giant muffin filled with processed wheat flour, and more sugar than anything else. Being the total push-over of a mom I’ve turned out to be, I almost bought him one – but then I realized in less than an hour, he and I could make a more delicious and infinitely healthier treat. Not only would he get his “cupcake,” but we’d also get to spend some time together in the kitchen. 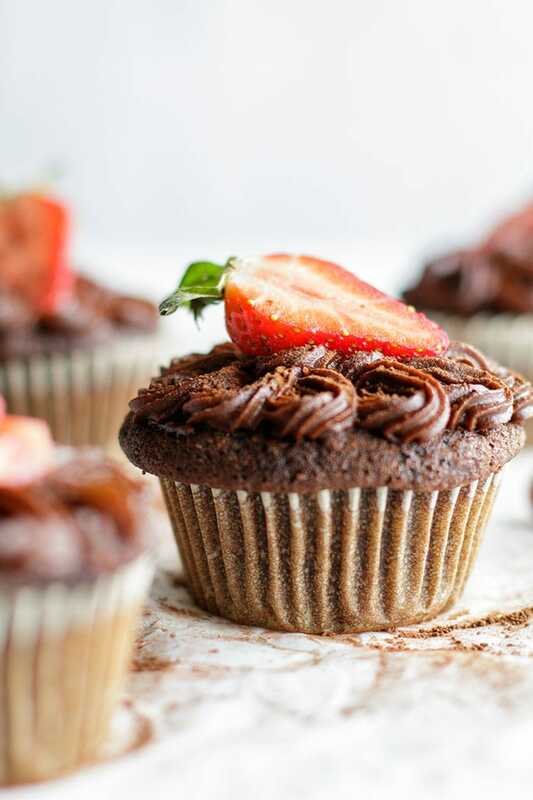 These healthy chocolate cupcakes are spread with a rich and fudgy Healthy Chocolate Frosting. If you missed the recipe earlier this week, I urge you to go see what healthy ingredient makes up the base of this recipe! Over the years, I’ve experimented with making cupcakes out of a variety of different healthier flours. I felt oat flour made them too “gummy,” and rice flour left them a little grainy. While I appreciate heartier textures in cookies, cupcakes need to be light and airy. The first time I tried Elana’s Pantry coconut flour cupcakes, I was hooked. Coconut flour is defintely touchy. If you don’t measure correctly, you can end up with a gummy cake, or one that is too dry to eat. But if you are careful with your measurements, you end up with a gluten free chocolate cupcake that is as close to a regular white flour cake as you can get. I’ve made these for birthdays at work, and I used a similar recipe for my nephew’s birthday cake. It’s always loved by everyone I share it with. Coconut flour is touchy, so it’s best not to make changes to the recipe (like subbing applesauce for the oil or reducing the amount of sweetener). Measure all the ingredients carefully. The other tip is to watch your cupcakes closely as they are baking. Overcooked coconut flour treats become really dry. 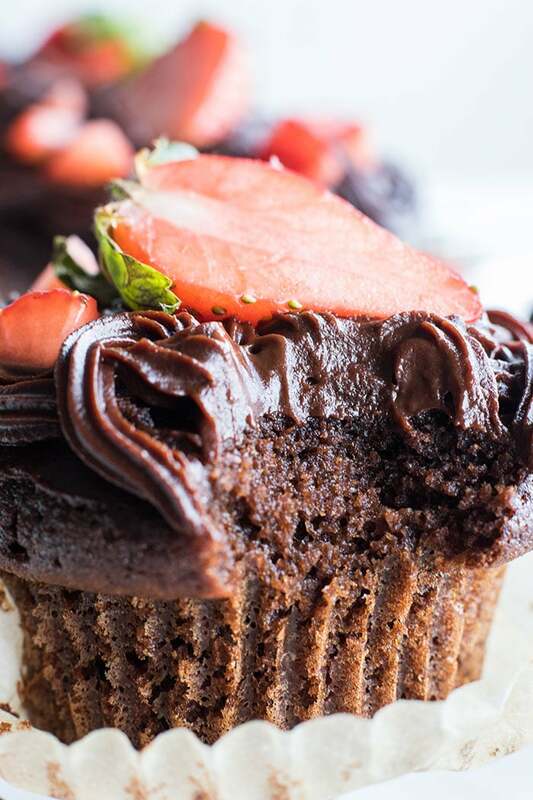 I take my cupcakes out of the oven when they are still slightly undercooked in the center – we love to just fill that little indent with a little extra Healthy Chocolate Frosting! Make it Gluten Free: There is some concern among the gluten free community over whether vanilla extract is gluten free. The consensus is that the ingredient of concern in vanilla extract is the alcohol, but since the alcohol is distilled, it is gluten free. If you’re still concerned about using a grain-derived product, opt for an alcohol free vanilla. 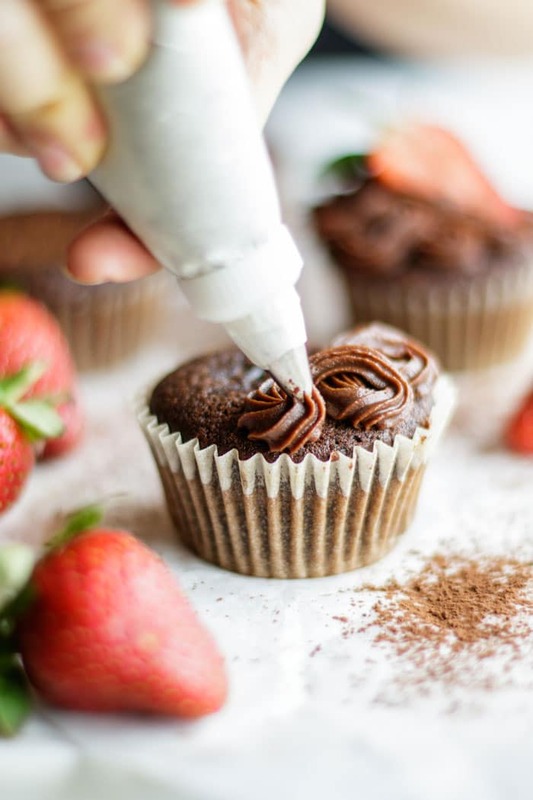 Make it Paleo: Both these gluten free chocolate cupcakes and my healthy chocolate frosting can be paleo compliant if using honey instead of date syrup, and either omitting the vanilla, or using a scraped vanilla bean. 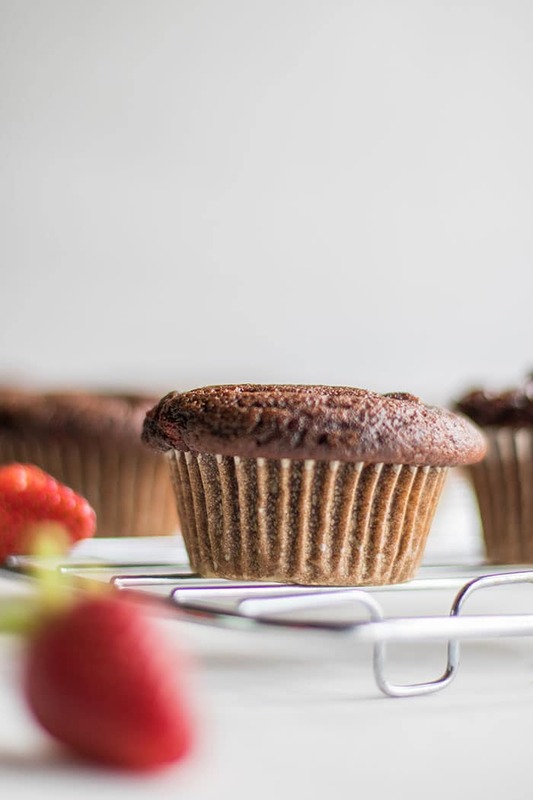 These healthy chocolate cupcakes are easy to make, and result in light and fluffy cake. We love to add chopped strawberries to infuse them with a fruity flavor! Top these with my Healthy Chocolate Frosting for an indulgent but nutritious option. These cupcakes are adapted from Leelalicious's Coconut Flour Chocolate Muffins from her Coconut Flour Cookbook. Add the coconut flour, cocoa powder, arrowroot, baking soda, and sea salt to a small box. In a larger bowl, add eggs, honey, oil, and vanilla. Whisk until combined. Add dry ingredients to the wet, and stir well, until all coconut flour clumps have been smoothed. There is no reason to worry about "overstirring" with coconut flour. Fold in chopped strawberries. Use just 1/2 of a cup, and add extra strawberries to the tops of these if desired. Too many strawberries will make the cupcakes gummy, but 1/2 cup gives them a fruity tasty and adds some moistness to the cupcakes. For best results, use parchment paper liners. Regular cupcakes papers are fine, but the coconut flour sticks, and they slide easily out of the parchment liners. I use parchment liners for everything now. Bake cupcakes for 16-20 minutes, until the center is just a little undercooked. I recommend checking on them at 15 minutes, and then continuing to cook until they are mostly baked. Be sure not to overbake them. Coconut flour baked goods stick to traditional muffin papers. While you can use a regular liner, these parchment liners will make your cupcakes so much easier to enjoy! Once I started using these, I switched to using them for all my baked goods. It’s so nice to have a muffin just slide out of the liner with no crumb loss! I’ve also tried silicone liners for these Paleo Chocolate Cupcakes, but I found they were difficult to clean, and the cupcakes didn’t slide out nearly as nice as with these parchment ones. 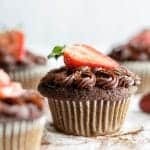 This Paleo Chocolate Cupcake post contains affiliate links, which means that if you click on one of the product links, I’ll receive a small percentage of any purchases made. I love cupcakes and i will try these cupcakes for sure. That's great to hear, Deepika! Happy Valentine's Day. You had me with strawberry and they you added cupcake! This looks so good!! Thanks Deanna! They are delicious. Your toddler isn't the only one with a cupcake obsession. ;-) These are so pretty and my gluten-free son would love them! That's great! My son doesn't have to eat gluten free but I love giving him these options because they are just healthier! We are obsessed with chocolate cupcakes in our house, will have to try this version as it looks amazing! Haha, love that you are cupcake lovers! They are a fun treat. 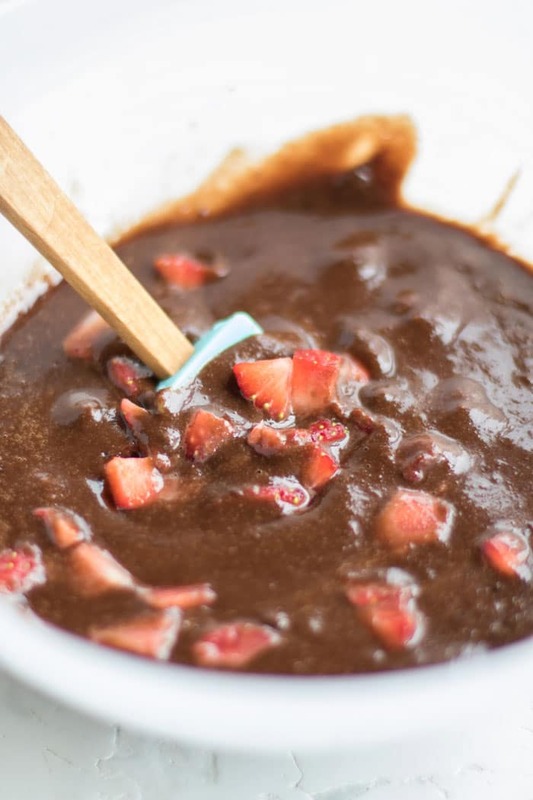 Strawberries and chocolate are such a great combo! Love this idea, it would make such a cute Valentine's day treat! Hi Andrea -- thank you! They are fun -- meant these for Valentine's Day, but of course that meant we were eating them the end of January. Looks soooo inviting! I love the use of coconut flour and honey, it makes it more healthier and tastier. Definitely a healthy treat! Yes, they are a great option for people looking to add more nutrients into their sweet treats!